We added a elevated catio to our home a few months ago. It is elevated so our Abys have some isolation from ground insects and stray dogs. 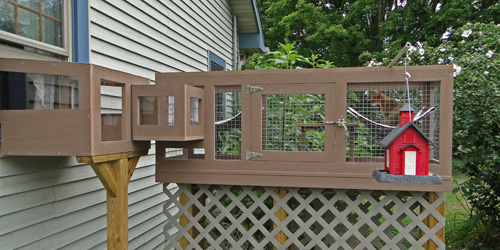 The catio has three section. After entering through a pet door inserted into the window of our house there is a small weatherproof sun room. From this room there is a short enclosed walkway which leads into a airy cage that contains two hammocks. You will also notice in the pictures that there is a small bird feeder (red school house) hanging nearby. 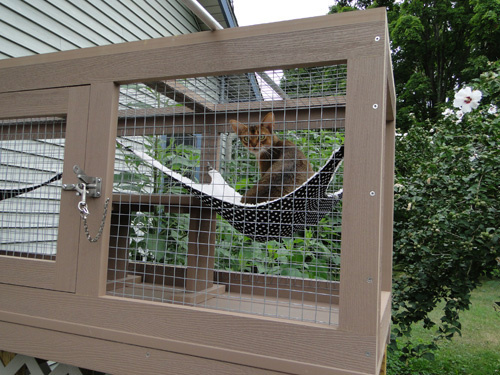 Our cats have free access to the catio throughout the day (they are excluded at night). Our Aby's immediately loved the catio and quickly learned to zoom in and out. During the summer the bird feeder wasn't used but we had hummingbirds visiting our flowers and our Abys were mesmerized by flying mice. During the fall, blowing leaves were their new prey. Suddenly we found Abys walking around our kitchen growling while they held a leaf in their mouth. Now as winter approaches the bird feeder is constantly visited by birds (who quickly learned to ignore the cats) and the cats are again enthralled. We always thought our Abys were fair weather felines but we learned otherwise. They are out in all sorts of weather even rain (who knew?). Perhaps even more surprising is that now that the temperature is dipping into the teens they will still spend extended periods of time in the open air cage before returning to the sun room to lounge. We can only wait and wonder what will happen when it snows.